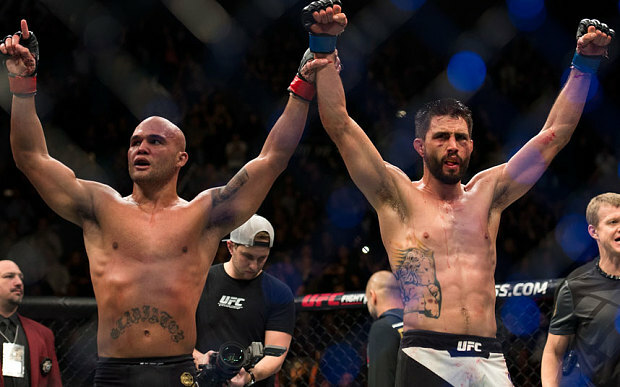 After throwing down for 25 minutes, Carlos Condit and Robbie Lawler acknowledged the raucous crowd that was on its feet. Published on Sunday, 1/3/16, at 9:31 p.m. Eastern. In the biggest fight of his career, Carlos Condit delivered the finest performance of his career. Then he was robbed of UFC gold by the judges. Similar to the way he took the belt from Johny Hendricks via split decision, Robbie Lawler dominated the fifth round, hurt Condit badly more than once and escaped with the welterweight belt by SD (49-48, 48-49 & 49-48) at UFC 195 in Las Vegas. Lawler’s betting backers, including myself, were fortunate to take the cash at the -120 price. Supporters of the ‘over’ (4.5 rounds, +110 payout) were also winners. The prop wager for Lawler to win by five-round decision paid a +200 return (risk $100 to win $200). BrianEdwardsSports scored the bout 49-48 in favor of Condit, giving him Rounds 1, 3 and 4. We felt Round 2 could’ve gone either way, while Condit’s rounds were clearly for him and the fifth undoubtedly belonged to Lawler. Condit was more active and landed 77 more strikes. After losing the fifth round of a tight UD loss to Hendricks in their first meeting for the interim 170-pound belt, Lawler has now gone into three straight title fights needing to win or finish in the final stanza. He’s emerged victorious in all three instances against Hendricks, Rory MacDonald and Condit. Condit and Lawler were both class acts after the fight. Lawler acknowledged how close the fight was and offered to rematch with Condit, who hinted at retirement in what I felt was simply (and understandably) a ploy to get an immediate rematch. Dana White was non-committal about a potential rematch, but he certainly didn’t rule it out. If a rematch doesn’t materialize, look for Lawler to make his third title defense against Tyron Woodley. Stipe Miocic made his case for a title shot by destroying Andrei Arlovski via knockout just 59 seconds into the co-main event. Miocic cashed tickets as a -230 ‘chalk,’ while ‘under’ backers (1.5 rounds) hit a nice +140 payout (risk $100 to win $140). Miocic improved to 8-2 in the UFC and garnered a Performance of the Night bonus. Arlovski saw his six-fight winning streak snapped in what was his first loss since falling against Anthony Johnson nearly three years ago. In a pivotal welterweight clash, Albert Tumenov got the nod over Lorenz Larkin in a split-decision (29-28, 28-29, 29-28) affair. The 24-year-old Tumenov won his fifth straight fight, hooking up his backers as a -240 favorite. 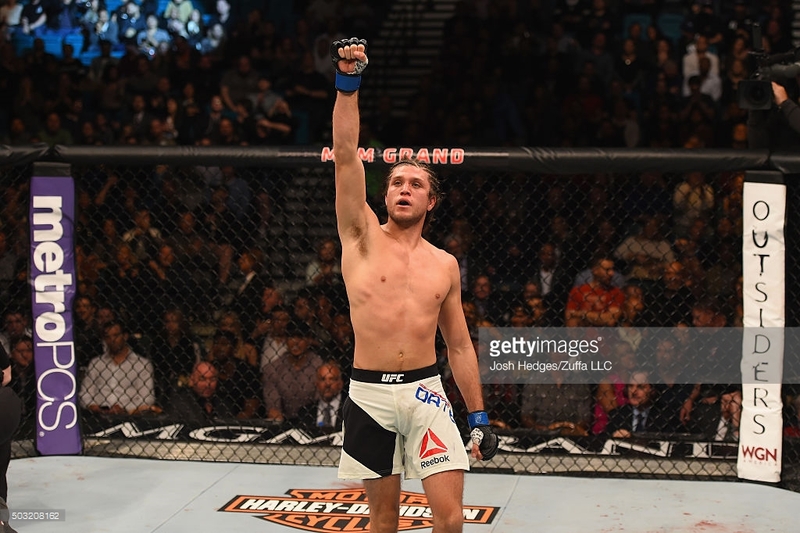 Brian Ortega remain undefeated with a third-round submission victory over Diego Brandao at UFC 195 in Las Vegas. Brian Ortega, another 24-year-old, went into Round 3 of his featherweight scrap with Diego Brandao down on the scorecards. However, it wouldn’t matter when the BJJ blackbelt locked on a triangle choke that forced Brandao to tap at the 1:37 mark of the final stanza. Ortega prevailed as a -180 ‘chalk,’ while ‘over’ (1.5 rounds) backers also cashed a winner. Ortega improved to 10-0 for his career with one no-contest. In the pay-per-view lid-lifter, Abel Trujillo submitted (guillotine choke) Tony Sims at the 3:18 mark of Round 1 to hook up his supporters as a short +120 underdog. After two years away from the Octagon, Michael McDonald, yet another 24-year-old rising star, returned to submit Massanori Kanehara with a rear-naked choke in the second round. McDonald was the biggest favorite on the card at a price north of -500. He earned a $50,000 bonus for Performance of the Night. Alex Morono was the biggest underdog winner in his split-decision triumph (29-28, 27-30, 29-28) over Kyle Noke as a +310 ‘dog. Until the Lawler-Condit thriller went down, it seemed as if Dustin Poirier and Joe Duffy were on the cusp of earning Fight of the Night honors. BE Sports gave Poirier the nod by a 30-27 score. The judges had it in favor of the Louisiana native by scores of 30-27, 30-26 and 30-27. Round 1 was outstanding. Duffy broke Poirier’s nose in two different places while they stood and traded for the first several minutes of the round. Poirier landed big shots as well and scored a takedown that led to some ground-and-pound punishment in the latter stages of the stanza. Poirier again secured a takedown in the second round and controlled Duffy from the top while pounding the Irish fighter with elbows. The third round was more competitive, with Duffy unsuccessfully attempting a triangle choke in the waning seconds. Poirier, who was a +140 underdog, improved to 3-0 since moving up to the lightweight loop. He should get a top-10 contender his next time out.